Results from this past weekend's Autonomous Vehicle Competition. 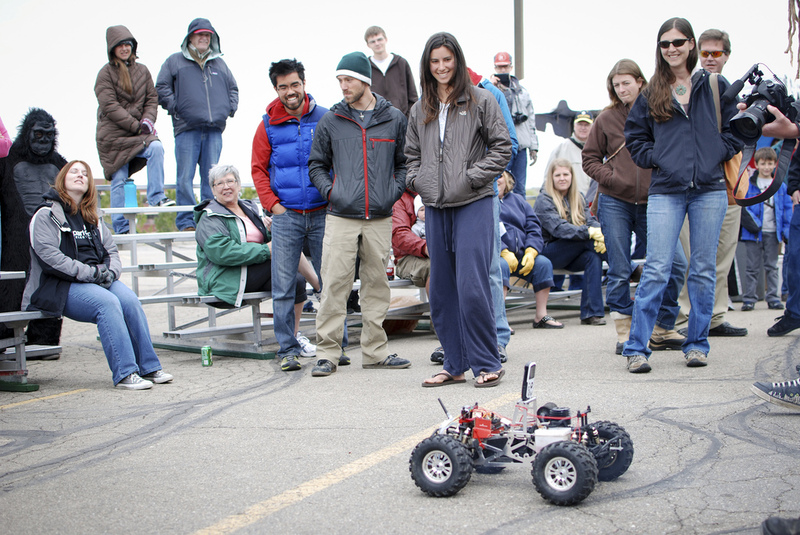 As you may have heard, the third annual SparkFun Autonomous Vehicle Competition took place this past Saturday. As has come to be expected, it was an amazing day of robotics, camaraderie, and good ol' fashioned mayhem. We are going to post the entire recap video next week (there is a TON of footage to sort through), but we wanted to pass on the results and some of our favorite photos. Some of the spectators take in the race. Notice anything strange here? Hint: it's a gorilla. The day got off to a bit of a rough start as the weather was not exactly cooperating - it was cloudy and fairly cold, with a light snow falling. However, nothing could dampen the competitive spirit of the AVC and the event went on without a hitch. All in all, we had almost 700 people attend - by far the biggest AVC yet! One of the SparkFun entries was a dinosaur. Yes, a dinosaur. With thick cloud cover and rain/snow, many of the vehicles struggled to get a GPS lock. This made the course even more difficult than in years past and vehicles were struggling. The first bot to break through was Team Autocrusher with a time of 2 minutes and 4 seconds. 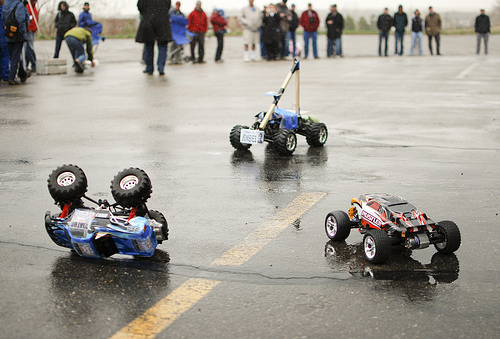 This opened the floodgates, and as the heats went on, more ground vehicles were able to successfully complete the course. These vehicles look very, very confused. 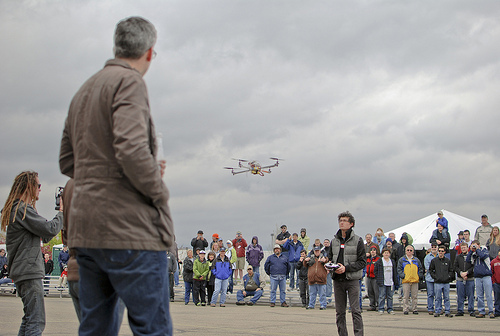 As far as aerial vehicles went, it was tough going all day as the clouds and weather wreaked havoc on the autonomous planes and quadcopters. Two teams, Death by Pinetree and Robota, would battle back and forth all day for the victory. A quadcopter tries its luck. It was an amazing day to say the least and we are already looking forward to next year. 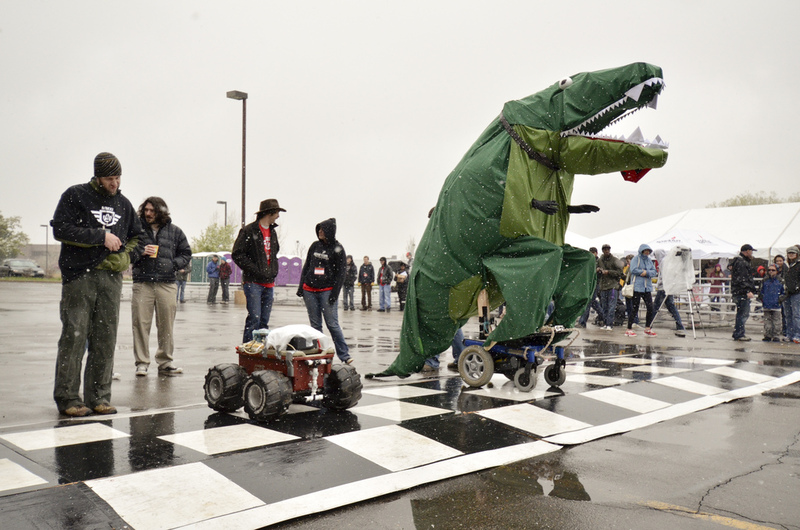 Check out the SparkFun Flickr for more pictures and, as I mentioned, we will be posting up a recap video soon. Hope to see you all next year and thank you to everyone who made it out this time around - it was a blast! odd.. women at a robotics event raises more interest then the gorilla in the bleachers? Now that's saying something! About 1 in 10 doctorate candidates in engineering are women, about 3 in 10 doctorate candidates in science are women, and these are just figures from 2003 (from livescience.com). Science: it's not a boys club anymore. There's nothing strange about females! Got to love how he mentions the females but totally missed the gorilla. There's nothing strange about gorillas! Wait, is it a female gorilla? Fair enough - let's swap "strange" for "awesome and unexpected"
AVC 2011 was spectacular, thanks again to the staff and competitors for an outstanding event. It is telling that many of the vehicles disappeared from frame quite quickly on the mass start. Next year I imagine it will no longer be possible to run behind and keep up with the fastest ground robots. Wow, our car really did go aim for ankles! Thanks for posting the links to the videos! I just posted a page describing my robot strategy this year - which proved to be remarkably unsuccessful. I've also started compiling a table of some of the features of the ground robot entries in section 5. Could I ask for some details from your robot so I can add to the page? Who are the other team contacts for SparkFun teams? Here's some of the video I took at the event. Check the mass start! Just wanted to say, I was at AVC and it was fun! Except for the part where Plan B's plan attacked me twice! I know a lot of the racers have websites that give more details in to their design, any chance of getting a compiled list of websites? I would be interested in seeing how each racer attempted the same challenge differently. Ooh! How about an autonomous bot that doesn't compete, just takes video? We have that, his name's Gregg. I think people should either stay off the track or run the 'bots one at a time, so that obstacle-avoidance sensors don't get all confused. AND SO THAT PEOPLE DON'T JUST WALK STUPIDLY IN FRONT OF THE CARS DURING RUNS SO THAT THE BOTS CRASH AND THEN THEY DON'T FEEL THE HIT AND JUST STAY LOST IN THEIR COFFEE!!!! We had crowd control, but people just got too excited and distracted. We will have better crowd control next year. My voice got hoarse by the end of the day and I couldn't yell at people anymore. Hmmm, this IS Sparkfun, how about crowd control robots along the track (I am envisioning Spykee, on steroids, with a badge), THEY can announce the race, ask people to stay back. You can save your voice and make some fun toys to boot. I guess so. But couldn't the humans just be considered another obsatcle to avoid? Yeah, there were way too many people on the course during the runs. One of the problems was it was difficult to know what was going on unless you were actually following the competition. The band just kept playing on during the runs. The band should stop and the PA system used to follow the run, complete with instructions to get off the course. The only problem with building some kind of wall would be that then robots might not end up in the lake -- the highlight of the race. Looking at the video, I feel the same way. There needs to be a clear divider between the audience and the competition. The only people allow on course during runs are the competitors and the judges. Everyone else should be kept far enough away to not interfere with runs, and also for their safety. The flying vehicles especially seem dangerous, I'm sure the AMA would cringe about planes flying above people, or flying into a crowd of people! Congrats to everybody who competed! Any tips from the competitors and spectators, for those of us who will be doing the AVC for the first time next year? Thanks! Sneak out the night before and paint a UV line around the track? Start early. Don't rely on GPS alone. And yet the best dressed award went to a guy in a monkey suit?!? Looks like a great time. Maybe next year I'll be able to attend. Man, whatever you do, don't mess with that Robert guy! hehe, no kidding. and it worked at least half of the time too! I'd like to see the full results too! I'm working on gathering all the times right now. I'll post them up as soon as I get them in my paws. Yeah, best times would be really cool to see! So, how many ground / air vehicles actually showed up? Can we get a picture (if one is available) of Dr. Zeus' Magical Flaming Banana? I think his costume put him over the top for best dressed. Here is a picture of his vehicle. I think he needs to work on the weather proofing for his rig. It's one banana short of dry. You do have to love this weather: SNOW in April. Too bad the guy with the snow plow didn't show up. The only thing that could top the snow in sunny down town Boulder (OK. south east of down town), would have it blowing 120 MPH too. Then you could require the rigs to get their power from the wind. PS- We are sending you more snow from âwarmâ Seattle. Where can we get an AVC t-shirt from and when are you going to start selling the AVC 2011 poster? Another great day at SFE! Thanks so much to everyone there. It was amazing to see how far the ground vehicles have come in just one year. Times were incredibly fast. Kudos to everyone that that put soldering tip to PCB, all the teams were great.